1. Ahenny. North Cross. West Face. Base Detail. West Face: BASE: The raised Christ / Mission to the Apostles. A rectangular panel shows 7 figures, with the central figure presumably Christ standing frontally. The raised Christ / Mission to the Apostles. 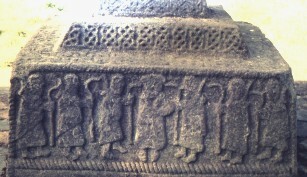 A rectangular panel shows 7 figures, with the central figure presumably Christ standing frontally. New Testament.